[Affordable Housing Racket] The more affordable housing they build will draw more people to the Keys. Has anyone ever seen an empty house or apartment for very long? No. “Build it and they will come.” Developers get special treatment to build them. Changes in density and height restrictions to name just two. And the BOCC wants to use every bit of empty land in the Keys to put them on. More housing equals more people. Even dumb ol’ me figured that out. Who’s behind this racket? Habitat for Humanity, the developers? Follow the money and see who really benefits. Don’t be duped, thinking we’re taking care of our own, we’re not. We’re taking care of developers. At the same time, we’re inviting more people to the Keys, increasing the population, with the false hope of affordable rents. [Tiny House] Have you heard about the tiny house movement? What was once a small hobbyist niche a decade ago has now exploded into an extremely popular lifestyle design choice while garnering a great deal of interest from the mainstream media and people from all walks of life. The great thing about tiny houses is that they’re almost always built on a trailer (not permanently affixed to the ground). But will Monroe County allow it? Tiny houses are built this way because they rarely conform with any municipality’s zoning requirements (which typically require any legal residence to be 600 square feet in size or larger). The typical tiny house ranges in size from 69 square feet to a few hundred square feet and is extremely mobile. Come on, Monroe County zoning jerks, I mean workers, get with it and help your locals. 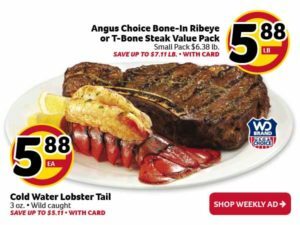 [“Overfishing”] The British Tabloid, Mail recently reveals astonishing evidence that NOAA which is considered the world’s leading source of climate data rushed to publish a landmark paper that exaggerated global warming and was timed to influence the historic Paris Agreement on climate change. A high-level whistleblower has told the newspaper that National Oceanic and Atmospheric Administration (NOAA) breached its own rules on scientific integrity when it published the sensational but flawed report, aimed at making the maximum possible impact on world leaders including Barack Obama and David Cameron at the UN climate conference in Paris in 2015. [Friday Joke] Me: it’s not about how many times you fall, it’s about how many times you get back up. Cop: That’s not how field sobriety test work. [Steel Boat] This boat was built right after WWII in Troy Ohio by the Hobart Bros who made welding equip, food service equip among other things. 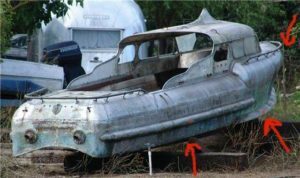 They decided to try the boat business as they invented stainless steel welding equip and the hydraulic hammers that form stainless steel. The boat was completed and launched on the Miami river- which runs through Troy and on it’s maiden voyage water washed over the stern and swamped (sunk) the boat. This was the beginning and end of the Hobart Bros. boat venture.I found this online but haven’t found any other information on the boat. [Tiny Homes] Some people in the Keys are so low grade they actually think living in shipping containers converted to homes is cool. How trashy can one get? It is bad enough that some storage yards are using these for quick storage units. The Keys were always low rent but this is pushing the limit to self respect in paradise. What next tent cities? [Low Income Struggle] The United Way of the Florida Keys announces that 42% of year-round households in Monroe County struggle to pay for basic needs such as housing, child care, food, transportation, health care, and technology according to the 2018 ALICE Report. Statewide 46% of households face similar financial challenges. In Monroe County, the percentage of low-income workers struggling to cover essentials has decreased for the third consecutive study. If someone doesn’t start a spray tan business named “Executive Time” I will lose all faith in American capitalism. That round house abortion on Colson Drive in Cudjoe Gardens is still standing and unfinished. Isn’t it enough that the owners must be so poor they cannot finish that monstrosity, but live in it without a permit? How can a multi-million dollar area like the Gardens allow this? Keys Coffee Mobile is now at the Big Pine Key Flea Market. We have Cuban espresso, regular coffee, hash browns, toasted bagels, butter, cream cheese, sausage or bacon, real melted cheese, burgers, hoagies and pizza. Call me at 313-610-3477 and I’ll have your order hot and ready for you. We’re right there in the parking lot. [Vote Independent] Would it not be logical and sane to not register to vote? To not acknowledge you are part of a political party and to become totally independent without any connections to any organized political group? That would scare the hell out of the political regime and give American citizens the right to vote their way instead of being pressured by group affiliations. Be yourself and think for yourself, you are not a lemming. [“Overfishing”] The Tortugas are nothing like they were. The reef decline that I noticed from 1985 – 1994 told me all I needed to know. Enjoy the sunshine while it shines upon you. [“Mary Poppins a racist”] It seems people are striking at anything and everything to divide us – now old classic films. What’s next? Wizard of Oz? Sound of Music? Little Rascals? Fat Albert cartoons? Whatever happened to asking what you can do for your country? Today it’s what can the country do for you? My friend and I decided to drink beer until we understood women. We’ve been drunk for 35 years. The young guy says, “Well, she is 27 years old, tall, with red hair, blue eyes, is buxom, wearing no bra, long legs, and is wearing short shorts. To which the old guy says, “Doesn’t matter, let’s look for yours. Who do sheriff’s deputy‘s talk on the phone all day to? It seems that every time I see a cop stopped, he’s yakking away. [Immigration Redux] Is it just me, or does anyone else find it amazing that during the mad cow epidemic our government could track a single cow, born in Canada almost three years earlier, right to the stall where she slept in the state of Washington? And, they tracked her calves to their stalls. But they are unable to locate 11 million illegal aliens wandering around our country. Maybe we should give each of them a cow. [Privacy] If someone uses your picture, name or family data for profit, to slander, or to make a joke for notoriety, can they be sued? or do they have to be VIPS and rich? Smells like only the rich and influential sue for everything. [Expensive] $50 per hour to rake pea rock or cut grass? $100 per hour to paint a house? No wonder the locals are starving, nobody in their right mind will pay those obnoxious wages for menial tasks. The only reason such prices per hour are charged in the Keys is because the merchants think they have to make a full year’s net income in a 6 month season, so they over charge for everything and lay around bitching about money. If you can’t do it your self in the Keys, you have to either be rich or ready to get out. [“Affordable housing”] None of us Keys locals want the Keys to be an immigrant s**thole. [The Movies] Want to feel old? 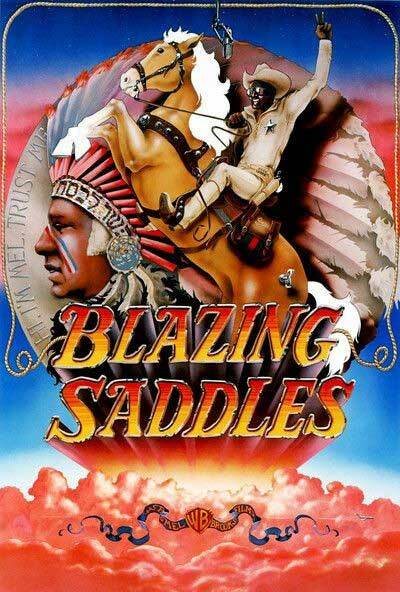 45 years ago, Blazing Saddles was released on February 7, 1974. [Restaurant Review] Looe Key Tiki Bar & Grill: Jam Band Taco Tuesday. I tried to like the place. The Jam Band was great. Super dance crowd. Nice atmosphere. Food: Not so much. Everything was cold. Nacho Grande–cold. Pulled pork sandwich-cold. Tacos–too much cumin/chili powder–cold. Service: Terrible. Couldn’t get my beer refilled until way after I had eaten.